Sam Arnold – perfect ten. 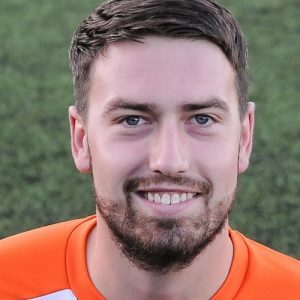 Goalkeeper Sam Arnold’s tenth clean sheet of the season was the foundation for Khalsa hard-earned three points at strugglers Dunkirk which saw Ian Rowe’s side move into second spot. They say to win things, sometimes you have to win in ugly fashion. And it gets not much uglier than this showing. Although Lee Chilton’s tap in on 11 minutes from Dan Westwood’s cross will be what the record books will show as the deciding factor, it was a great double save by Arnold from McKenna Parton ten minutes later that really turned the game. In truth, there was precious little of note in the match, almost everything fought in the middle third of the pitch. Khalsa, lacking most of the magic that has caused problems this season, had to rely on another excellent defensive performance and their single genuine opportunity. Dunkirk made Khalsa work hard – very hard – for their win. As early as the second minute Carlo Franco had to intervene to stop Romella Nangle from having an easy scoring opportunity. Following Chilton’s goal – his 17thin all competitions – Dave Meese almost doubled the lead on 29 minutes, Dunkirk keeper Richard Stainsby tipping over his header from Chilton’s corner. Four minutes later Darrell Thomas headed over a good opportunity for a Dunkirk equaliser and just before the break Joe Brown really should have done better with a free header from a Cameron Jones cross. If the first half was quiet, the second half was positively barren. Only a great surge by Nangle down the left and a lashed in cross which just evaded Thomas at the far post was worthy of note as both sides battled to deadlock. But the three points – however cosmetically unappealing – may prove extremely valuable come what May. Sporting Khalsa: Sam Arnold, Carlo Franco, Adam Osbourne, Leon Miles, Tes Robinson (captain), Alex Woodhouse (Liam Armstrong), Dave Meese, Rico Taylor (Alex Perry), Josh Thomas (Mensah Kinch), Dan Westwood, Lee Chilton. Subs not used: Luke Adams, Vidal Hendrickson.